Christian Legal Aid of Los Angeles’ mission is to share the love of Jesus Christ by cultivating a passion for justice in their community and providing free legal services and hope to those in need in Los Angeles County. 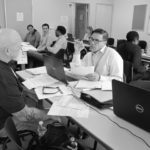 They hold free legal clinics at various churches and nonprofits across LA offering 60- to 90-minute legal consultations to very low income residents of the county. Their clinics are staffed by volunteer attorneys, law students, paralegals, and individuals of diverse backgrounds with a passion for justice.